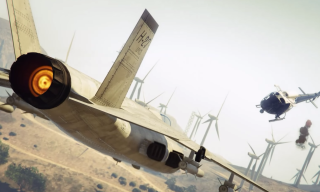 Indie rockers Wavves have put out a new video for their song "Leave" which features in Grand Theft Auto 5. The video was commissioned as part of a contest Rockstar ran that was won by a team of German GTA 5 editors extraordinaire known as YeahMAP. The video depicts an action-heavy prison escape, packed with stylish shots and plenty of familiar GTA staples. While I didn't enjoy it as much as another GTA 5 music video, I like the breezy, melancholic tune. Either way, watching the quality and quantity of content coming out of the GTA editor has been a joy. Any bets on which band puts out the next GTA 5 video? I suppose doom metal groups aren't likely candidates, but I can dream. For more, check out our favorite GTA 5 mods.